Responsible travel in Mongolia – being part of the solution, if you are reading this, you are already concerned about these issues. If you are planning to visit Mongolia, or are already in-country, it is likely that you came to experience the outstanding scenic beauty of the natural environment of Mongolia, and to learn about its culture and history, namely about the nomadic practice today and about the country’s heartland as the cradle of nomadic civilizations. You are most likely very conscious to tread lightly on the environment, to follow practices of “leave no trace” in wilderness you visit, and to support with your travel and actions benefits to communities and to sustainable development. This blog post is to provide you with information and ideas on what you can do to make your travel as green as possible. Probably you already have adopted a number of practices to give back while you are traveling, and to be part of the solution. Say No to Plastics – Adhere to Mongolia’s New Ban on Plastic Bags ! By now most people have heard of the alarming facts about plastic, the huge “islands of plastic” floating in the oceans, the catastrophic effects on sea life that dies from plastic. Birds and turtles ingest it, many animals get entangled in plastic. And of course, we ingest micro plastic, which is now present in seafood we eat, in water we drink. In 2050, predictions say, there will be more plastic than fish in the oceans. Less than 10 % of plastic is actually being recycled, one reason being that packaging is made of many different materials that can’t be separated efficiently to enable recycling. And don’t think that plastic will not end up in the ocean because it’s deposed of far from the sea. Rivers take it to the oceans, and garbage being sent to other countries will likely bring it closer to the ocean. Transport by ship increases the risk at least some will end up in the ocean. Where ever you are on this planet, be aware of your plastic use. Yes, it’s still made difficult in everyday life to reduce plastic, as so many products come in plastic containers, and goods are packaged in plastic still routinely in many places. In Mongolia, the sale, use, production and import of plastic bags thinner than 0.035 mm for packaging is being banned as of March 1, 2019. This is encouraging, though it remains to be seen how effectively it will be enforced. Play by the rule and support environmental protection in Mongolia by using cloth shopping bags, and small packaging bags (for produce etc.). If you are not bringing a cloth shopping bag with you, you can buy one in Mongolia from a number of shops and organizations, or get one from Stone Horse Expeditions (first one is free, second one for 5 $). To replace the thin bags used for holding produce, you can use small sacks made from thin cotton or mesh fabric. They come with zippers or draw strings. To have a few such sacks is handy anyway for travel, to keep small items, and to maintain order in your luggage. On a horse trek with Stone Horse, such sacks are useful when selecting and re-packing your gear and clothing for the expedition. We have them available for you for the trek, and for sale at low cost if you want to pick up more. As a seasoned traveler, an athlete, or just as a person conscious of the health of the planet and yourself, you probably are already avoiding plastic bottles for drinking water or other drinks. Plastic bottles make up a large volume of the rubbish littering the country side and of the floating garbage patches in the ocean. It is now also well established that micro-plastics leak into your drinking water from plastic bottles. So there are several very compelling reasons to stay away from water bottled in plastic. If you travel with Stone Horse Expeditions, we will provide you with one, or two on horse treks, stainless steel water bottles for the duration of the trip. These we will refill with safe drinking water – filtered or boiled or form larger water containers we carry. You may also have a travel mug, or coffee/tea cup that is re-usable and that you can use in any coffee shop to have your favorite drink served in for take-away. There is a multitude of such mugs and cups available now. If you join a horseback expedition with Stone Horse, or a camel trek, or have booked a Gobi Desert Tour, you will receive your individual cup for the trip. If you go to a restaurant or coffee shop, again it’s unfortunately still a routine that many drinks are served routinely with a plastic straw, regardless off whether it’s useful or needed, or you asked for it. One has to be really quick to let the person behind the counter or waiting staff know, that you don’t want a straw, but it can be done! If you like to use a straw, consider carrying your own fancy collapsible metal straw, for example the “FinalStraw”. 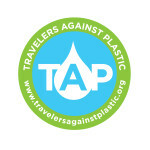 Stone Horse Expeditions is a member of the initiative TAP – Travelers Against Plastic. The TAP website is a great source of information on the alarming impacts of plastic on the natural environment, on sea life, and on all of us. There are also good books on how to reduce or eliminate plastic in your daily life, such as “No.More.Plastic” and “How to Give Up Plastic”. If you are a frequent traveler, a hiker or just a person who regularly enjoys outdoor pursuits, its likely you have a lot of the clothing and gear you need. Don’t buy what you don’t need – while making sure you have proper clothing for your chosen adventure. Make sure you have clothes warm enough, truly water proof, and on the other hand – for hot conditions – light enough and giving enough sun protection. When buying clothes, consider production practices of manufacturers and their commitment to environmental and social track record. Some brands are known for making garments from recycled materials, to source responsibly, to support campaigns for the protection of wild lands, to give their entire gains earned from tax breaks for the environment. Check out our list of recommended clothing and gear, or download our Free E-Book for tips packing for your Mongolia horse trek. For Gobi tours, also see our tips “Preparing for Your Gobi Adventure”. When purchasing travel clothing, of course keep Mongolian products in mind. Especially if you are looking for natural fiber! If you need gloves, hats, long underwear, socks, leg warmers – consider Mongolian made products. Cashmere of course is best known, and Mongolian cashmere is top quality. It’s also the most expensive of the natural fibers, and there is an ecological aspect of cashmere. Cashmere having become one of the most important income sources of herders, the number of goats has increased dramatically in Mongolia, from 20 % to 80 % of the total livestock number. While goats inherently are not damaging, in such a large number and in combination with other changes that nomadic livestock husbandry has undergone in recent decades, they do contribute to land degradation. Efforts are underway to address this, and there are also targeted efforts to make cashmere production sustainable, such as the Sustainable Fibre Alliance, an organization working “with the extended cashmere supply chain, from herders to retailers…. to promote a global sustainability standard for cashmere production in order to preserve and restore grasslands, ensure animal welfare and secure livelihoods.” When buying cashmere products, see what information is available on the brands practices for sustainability. But consider also the less expensive, but perhaps equally beautiful and functional alternatives! Yak, camel and sheep wool products are becoming better, with more choice and ever better designs. All these fibers have great properties. Socks from camel and yak wool feel very comfortable, never damp, always cozy. Check them out. Camel wool brands offer both blankets and garments, sweaters, cardigans, vests, hats, gloves, you name it. There are plenty of shops downtown, and there are factory outlets of each of the Mongolian brands of natural fiber. On our city tour, or upon request, we can take you to these. The quality of souvenirs, namely the great variety of felt products, has greatly improved over the last decade. In Ulaanbaatar, you can find them in the large souvenir shops. There are all kinds of felt creations, from simple slippers to very artistic hats ! But also check out specialized shops that are affiliated with community programs and have worked long-term with mostly rural women to improve product quality and develop market access. One of these is the White Gold (Tsagaan Alt) shop. When traveling in the country side, watch out for or ask your tour operator about local cooperatives, small enterprises, women and community groups that may sale handicrafts and other products. If you want to volunteer or donate to causes you care about, there are opportunities for travelers to do so. Ask the tour operator you are traveling with for guidance and advice. For most travelers it’s not possible to totally avoid air travel to reach Mongolia, unless you travel by ocean for a while. Though from Asian neighbor countries and from Europe it’s possible of course. And the Trans- Siberian Railway Journey is a popular and very realistic option of course. Quite a few of our guests at the Ger Stay take the train from Beijing, or have traveled from Irkutsk, Moscow, Berlin, or even London. It’s a whole adventure itself if you take a long train ride traveling by train through China, Mongolia, Russia and more. (e.g. methane capture for power generation). So, you can check with your airline whether they offer opportunities to pay for carbon-offsetting. Especially Australian carriers have been leading the way in such schemes, and decide whether/how much you can/want to contribute. There are also websites where you can calculated your emissions through air travel and support worthwhile projects, for example South Pole. Or, do your own online research, for example on the site (1) quoted above. There is a wealth of information available online on organizations and schemes that facilitate carbon offsetting. While we have just learnt that tree planting does not directly off-set carbon emissions from air travel, not conceptually, and it would take a huge number if trees to offset emissions – but it is still a good environmental contribution to plant trees. There are opportunities to plant trees in public parks in Ulaanbaatar city and also other locations, and with several organizations. Ask your tour operator about opportunities to help with tree planting, or donate to a tree planting initiative. If you have traveled to Mongolia, you are likely interested in natural landscapes and wilderness anyway. Arrange your travels so that you really have enough time, to relax, to appreciate nature, to be alone in nature if you like. It helps to see what really matters in life, and perhaps what life is. There is always a lot to learn about sustainability from people who have lived for millennia in an environment where resources are scarce. While the life of nomadic herders in Mongolia today incorporates a lot of modern technology, and they are modern and educated people, there is still much to learn about sustainability from them – see what the water consumption per capita is, what relatively few possessions they have. This is not meant to glorify or romanticize hard ships of rural life, but it is a stark reminder of how excessive the material possessions have become that many of us strive for or have accumulated. There is a calm and confidence that I often feel herders have, despite the exceptional and existential risks inherent to their lifestyle. And it is something I have felt only people who are connected closely to the land have. I sensed it among ranchers in the West of the Unites States and remember it from farmers I spent time with as a child. The connection to the land, the earth, their animals, is something that cannot be replaced. There are more and more opportunities for travelers for truly authentic experiences of rural life in Mongolia. Check out the Herder Home Stay/Ger Stay we can arrange. It is only an hour and a half from Ulaanbaatar City, a great way to spend a day or two if you are traveling through Mongolia, by train, or if you are on a business trip and looking for a way to get out of town and see what rural life is really like. You can join in the chores of livestock husbandry, learn about Mongolian home cooking, or go for a ride with the herder. Obviously, I will end by saying Ride a Horse! But at first a word of caution. If you plan to do your own horse trek, without a tour operator – make sure you are safe. That you have some horse riding and packing experience, or at least enough outdoor/wilderness/survival experience, the right equipment to stay warm and safe, food supplies of the right kind and amount, navigation equipment, and knowledge of the area you ride into, of the weather that’s ahead, of the rivers you have to cross, – or maybe shouldn’t cross. Let somebody know your planned route and schedule. We have advised a number of groups and individuals organizing their own treks. It is in our interest that any horseback travel by visitors to Mongolia is safe. If you buy a horse, or several, are you sure you can care for them properly? Have you thought what happens to them after the end of your ride? To ensure the welfare of your horses is particular difficult if you don’t return to the place where you set off. If you do a round trip, you can rent horses, and return them to the owner, that’s the better solution.